A brick floor kitchen has always been a popular choice and remained a classic look for any home. Just search Google and you can see tons of ideas, patterns and styles available. 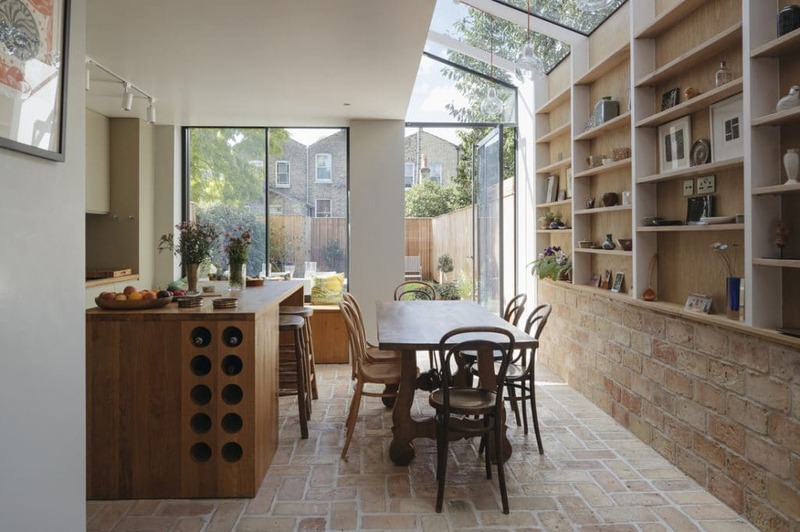 Most brick flooring can fit into any type of space from contemporary to a rustic kitchen look. Below you can see how our brick tiles look in both contemporary, rustic and modern settings. We actually offer a range of reclaimed brick tiles and terracotta tiles which that provide an original feel to any space. 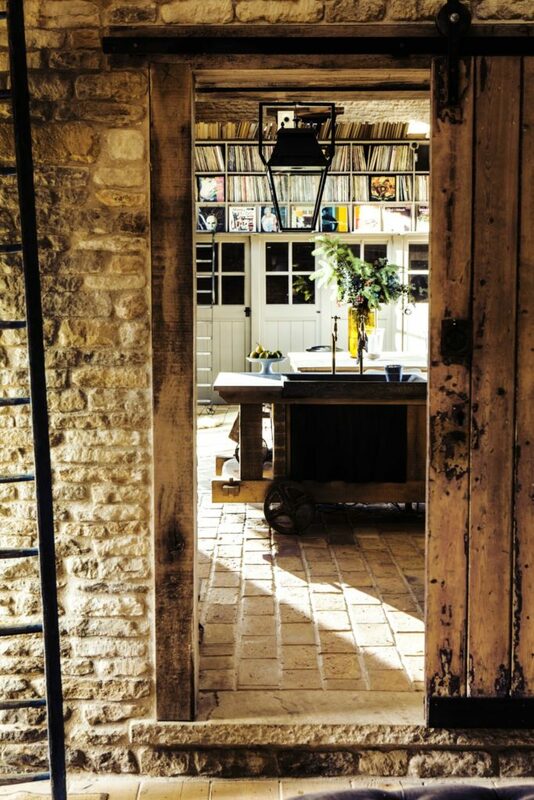 Feel free to check out our range of Reclaimed Brick Floor and Terracotta Floor Tiles. 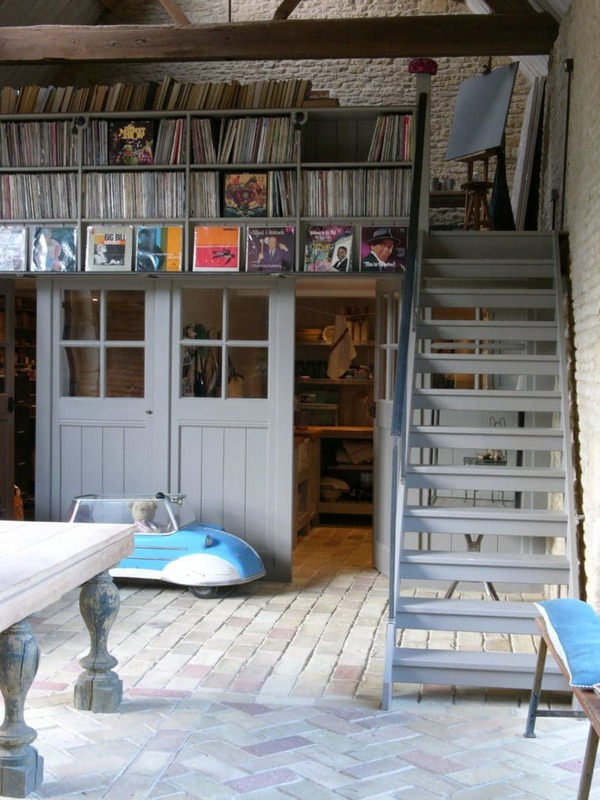 The great part about brick floors is that they are incredibly durable. Just visit any old historic cities and you can see hundred-year-old buildings built by brick. In fact, our reclaimed brick tiles tend to only look better with age and foot traffic. An important thing to note, that brick floors must be sealed every so often so they don’t hold moisture. You can also change the look of the floor depending on what type of finish and look you desire. Including a natural look all the way to a glossy shiny look. It’s really down to preferences. Below you can see a number of different floors we’ve laid in kitchens. These can offer you some inspiration as to how you’d like your kitchen to look. If you do have any questions or would like to make an enquiry, don’t hesitate to contact us. This first feature was designed and created by Neil Dusheiko Architects. An emerging practice who specialise in creating carefully crafted spaces with a richness in detail. They use innovative design and ideas to create stunning contemporary properties with an emphasis on natural light and natural materials. Needless to say, our brick floor was a perfect fit for this space and the company’s ethos, as we provide eco-friendly reclaimed bricks using only environmentally methods to treat them. A large terrace house in London, this was actually more of a personal project for the company. It was built for a family member and as you can see the floor looks great even in a contemporary setting like this. You can also notice our reclaimed brick tiles are also used on the back wall too, adding a great continuation to the floor. This seamless connection adds more space to the room and provides symmetry. 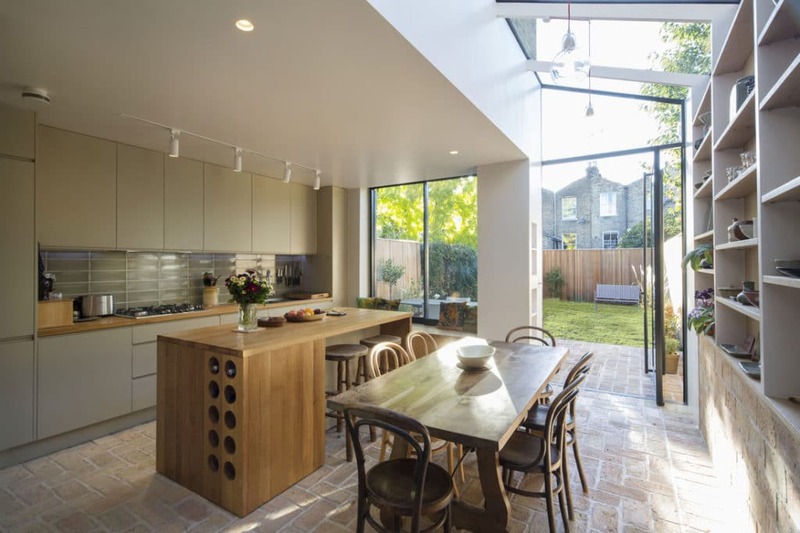 This house was actually shortlisted in the AJ Retrofit Awards 2017 & Longlisted in the “Don’t Move Improve” awards. 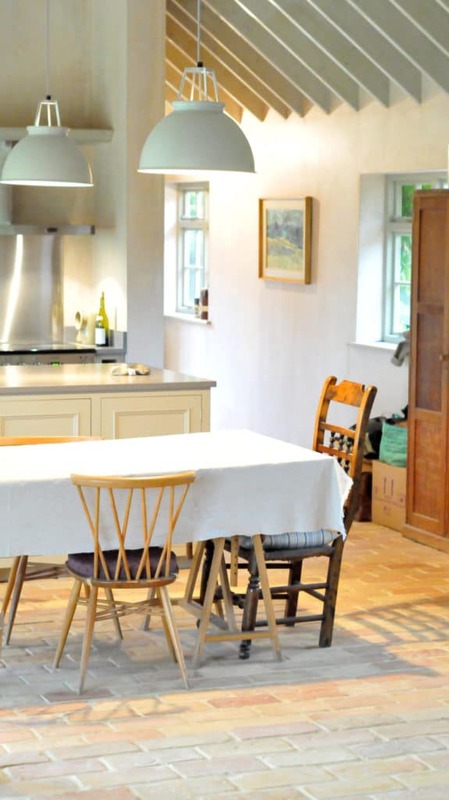 This second kitchen is an open plan rustic kitchen in the heart of the Cotswolds, Gloucestershire. Trinity Barns is a studio location set created by husband and wife team Atlanta Bartlett and Dave Coote. They are specialists in finding locations for the film and photographic industry. When they set up the Trinity Barns they already had a wealth of experience and our reclaimed brick floor tiles gave them the authentic feel and look they were after. As you can see in the pictures, part of the floor has been laid out in a 45 herringbone with contrasting stretcher inlay and header (see example below). This is a common pattern outlay for anyone that wants their floor to become the centrepiece of their room. The open plan kitchen/dining room area provides a real modern rustic style and the brick floor certainly adds character to the whole space. 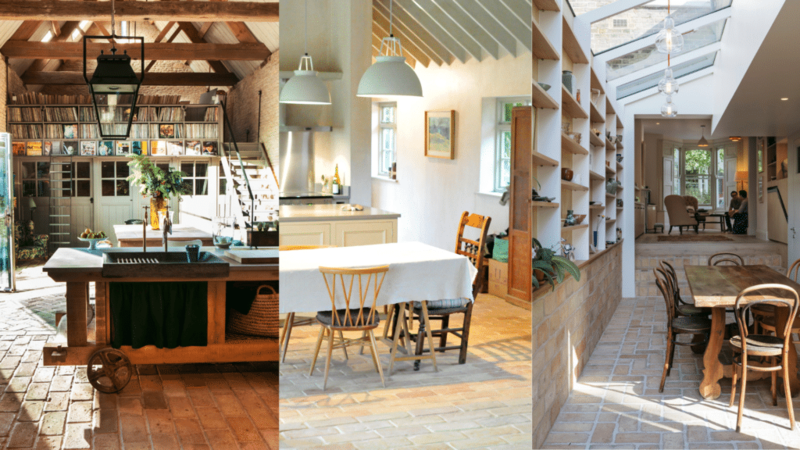 A 17th century converted barn that has been created into a beautiful modern rustic space. The floor is laid out over most of the downstairs and only adds character to the rooms. 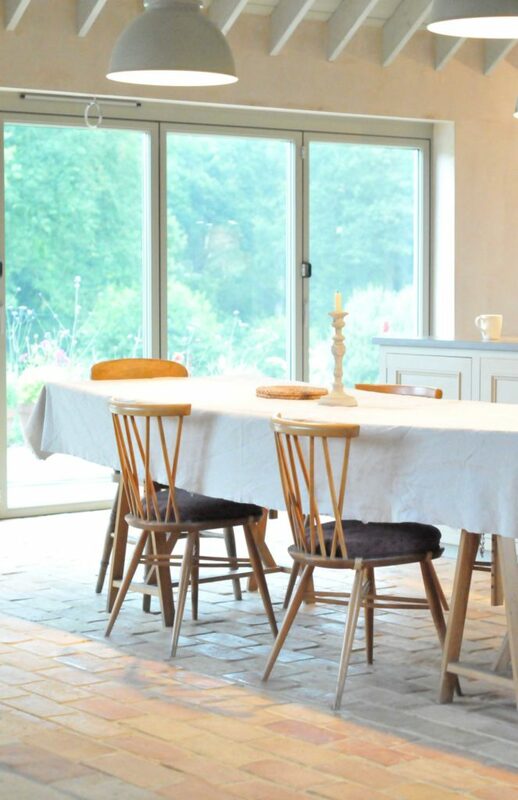 This idyllic setting has been lovingly restored and perfectly created for any photo or video shoots looking for a modern rustic kitchen look. Although this is a commercial property, it certainly provides inspiration to anyone looking for a similar look. If you’d like to find out more about this reclaimed brick floor tile, please check out our other pictures here. 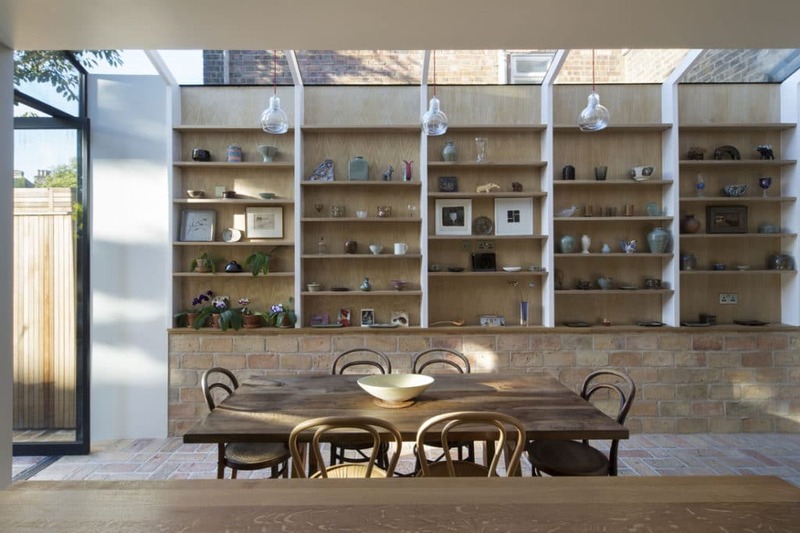 Another open plan living space that used our brick tiles. This beautiful modern but Mediterranean-feel house is in the heart of Surrey believe it or not, but could just as easily be sitting in the foothills of Andalucia or on the southern coast of Spain. Our floor was laid out over most of the downstairs living area in a stretch bond pattern. Although there is a somewhat minimalist feel, the colour coordination between the walls, tiles and furniture provide a cosy atmosphere. Something that is hard to achieve. We love this place for its contemporary furnishings and interiors, however, it still remains rustic as in keeping with the building itself. The great part about the brick here is it’s only going to get better with age. Areas with such high foot traffic as a kitchen, you may see other floorings wear, but our brick flooring is so durable they only look better as time goes on. And of course, you have a floor for life. As you can see with all the floors pictured here. They have all been finished with a natural water-based sealant in keeping with the rustic kitchen look. It is possible to have a satin finish – a glossy look that darkens the tiles. 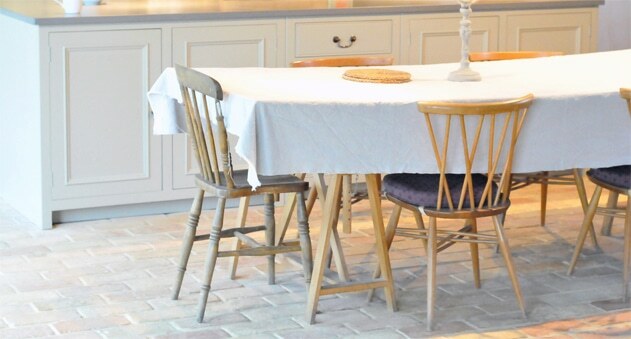 However, for an original rustic look, we’d recommend keeping the tiles natural look. If you are looking for a kitchen brick floor, don’t hesitate to check out our range of 11 brick floors and terracotta tiles. Or contact us anytime.